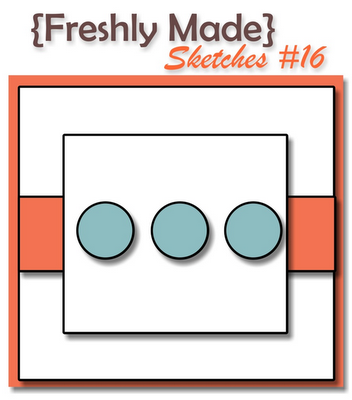 I am so excited to be a guest designer for Freshly Made Sketches this month. And this is such a fun sketch to start off the new year! I pulled out my new Fashionable Hearts embosslit again and paired it with the Cheerful Treat designer paper. Pretty cute, huh? :) If you get a chance to play along, stop on over at the Freshly Made Sketches blog to share your creation. I hope you have great day! And remember that the Occasions Mini starts today - yippee! Welcome to the team Jen! Your work is always exceptional. 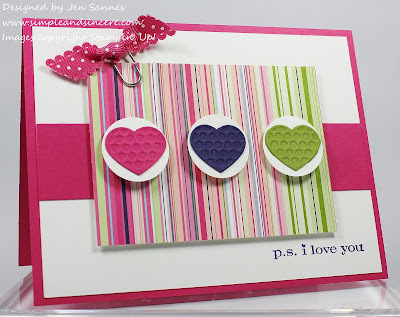 Love the bright hues and cute hearts! So glad you are joining us Jen! (Yikes, another Jen)! This is a great colorful card! So nice to see bright and cheery in the midst of winter blahs! I love all our Jens because they Jen-erate so many wonderful creations! Welcome! I love your cards - and that includes this one! Bright and crisp and beautifully done! This is so fun, I love the embossed hearts. So glad to have you on board with us, welcome to the team! The colors are so bright and cheerful - a pleasant sight during Wisconsin winters. The little clip and ribbon accent and adorable! TFS! You just sold me on the fashionable hearts! Beautifully done! So pretty! Love those embosslits -I just got mine last week and haven't had the chance to play with them yet but love what you did! The color combination is fantastic!